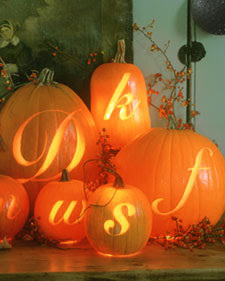 Put your personal stamp on your pumpkins this year - Create a monogram or initial and carve on to a pumpkin! Great for your doorstep to greet trick or treaters, have it line the aisle at your next outdoor wedding ceremony or even use the smaller size as a centerpiece. Many craft stores have the carvable pumpkins that you can keep year to year. You can't use real candles inside but you could put battery operated ones in there!